Note: This article describes the Accordion module as of Beaver Builder 2.2. For information on the new and changed features from earlier releases, see this article. The Accordion module provides a vertical list. Each item in the list can be expanded to display more detail or collapsed to hide the detail. One or more items in which you want a text excerpt to expand into a longer description with a "read more" label. Note that this would be similar to WordPress posts, but this would be a case in which static content is set up manually. An example is shown below. The Accordion module is constructed as a list of items, where each item is a box with a label and content. The module has a Style tab, which you can use to style all of the items the same way. See the section below on the Style tab. Each item includes a Label field and a Text Editor box for the content field. The Label field can include HTML tags, such as heading tags, for individual styling, images, and. The Text Editor box for content has the usual style options. Tip: You can make the layout in Accordion items more interesting by inserting the shortcode for a saved row or module into the text editor portion of an item. See the Related Article on shortcodes for more information. 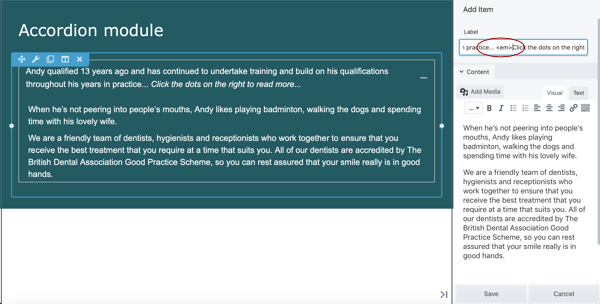 Here's an example to show how the Accordion module can be used to display a text excerpt, with a Read More link that expands into a longer description. The default plus sign has been replaced by the three dots that indicate an ellipsis. This technique works best when you have static content (not updated on a regular basis) because it requires manual setup. The trick is to put the first part into the Label field including the 'read more" text, and the expanded portion into the Text Editor, as shown in the following screenshot. The "read more" text is set off with <em> tags in the Label field. In this example, the default plus icon to expand the content was changed to Font Awesome ellipsis icon in the Icon section of the Style tab. The Items tab contains the following sections and fields. The Items section is shown in the following screenshot. By default set to No. If set to Yes, the first item will be expanded on the first view, before the user clicks to expand anything. 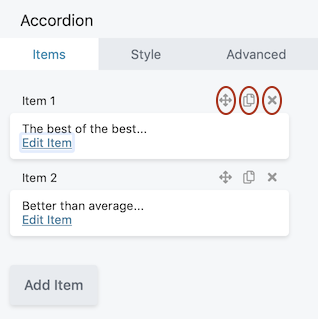 Note: After you save a label and text in the first item of the Accordion module, it remains open in the editing screen even when the Expand first item field is set to No. This is so that you can see the style settings while editing. The published page correctly follows the Expand first item setting. The Style tab is divided into four sections, shown in the following screenshot and described below. 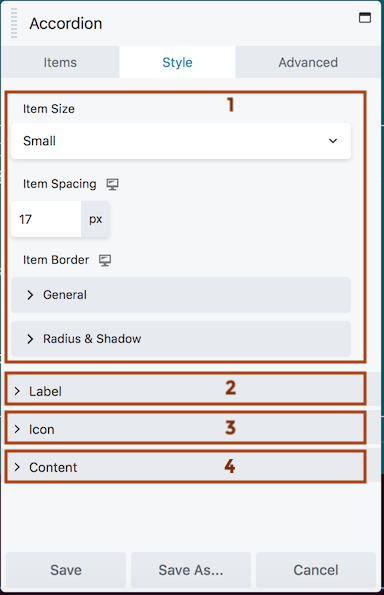 The top section has settings that style the item layout, with settings for item size, item spacing (the vertical space between items), and item border. The border settings use the new responsive Border section common to other modules. The Item size field has the choices Small, Medium, and Large. This setting functions like a preset and controls padding of the item and in some cases font size, as shown in the following table. When the font size is the default (in other words the font size set by the theme), then font size is controlled by this preset. If you set a specific font size for the label or content in the Typography section on this tab, then that custom size overrules the preset. Controls the styling of the item labels, which appear when the item is collapsed. Note: Accordion labels are not marked as headings in the rendered output and without any custom settings use the default text font and size. You can customize text font and size in the Text > Text typography section. Customize the icon that appears to expand and collapse the items. Controls the text that appears when the item is expanded. The Tabs module, which would display the labels as horizontal or vertical tabs. The Menu module, in which each item could link to details on a different page. See the Related Articles for more information.